Brutal Doom v20 released back in June, but that doesn't mean the modders aren't hard at work making it more brutal. The video above shows off the in-development "detailed destroyable bodies and gib physics" update which will roll out with Brutal Doom version 20b, which hasn't got a release date yet. The video above is a demo video, sure, but don't watch it in the office. It's basically footage of Doomguy repeatedly shooting at chunks of flesh. You don't want your co-workers to get the wrong idea, do you? It's already too late for me. 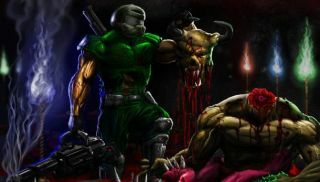 If you're yet to try Brutal Doom but have always wanted Doom to be more brutal, then you can read more about the mod over here. It's basically the same game just more bloody, with bonus flamethrowers and an assault rifle.